With a stay at Mashutti Country Lodge in Tzaneen, you'll be within a 15-minute drive of Agatha Crocodile Ranch and Tzaneen Museum. Featured amenities include a business center, dry cleaning/laundry services, and luggage storage. Planning an event in Tzaneen? This country house has 400 square feet (37 square meters) of space consisting of a conference center and meeting rooms. A roundtrip airport shuttle is provided for a surcharge (available on request), and free self parking is available onsite. With a stay at Lapalosa Lodge in Centurion (Die Hoewes), you'll be within a 15-minute drive of Voortrekker Monument and Kruger Museum. Free self parking is available onsite. 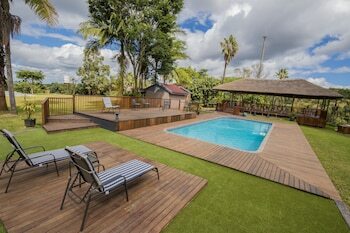 Located in Knysna, Bridgewater B&B is within a 5-minute drive of Knysna Quays and Knysna Elephant Park. Free self parking is available onsite. Located in Cape Town, A09 Dolphin Beach is near the beach, within a 5-minute walk of Dolphin Beach and Bloubergstrand Beach. Free self parking is available onsite. With a stay at Angora Lodge in Jansenville, you'll be within a 5-minute walk of Mohair Experience Museum and Sid Fourie Historical House Museum. The front desk is staffed during limited hours. When you stay at Rawdons in Nottingham Road, you'll be within a 5-minute drive of Gowrie Farm Golf Course. Free self parking is available onsite.